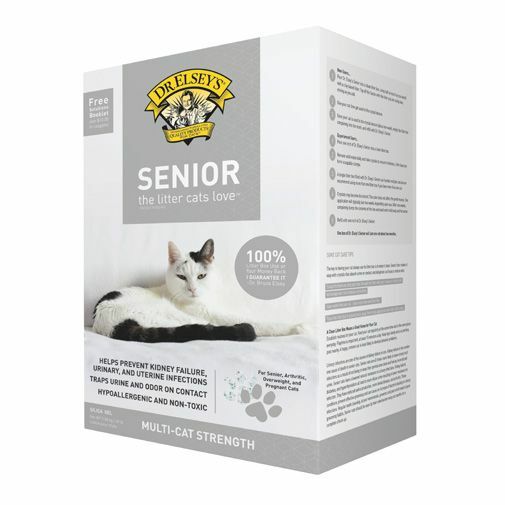 Home » Dr. Elsey's Senior Cat Litter 20 lb. Does Your Senior Cat Have Urinary Tract Infections? Senior litter absorbs urine and odor on contact and traps it inside the crystals to keep a cat’s genital area clean to help prevent urinary tract infections. Its small particle size and dust fines also coat and dehydrate cat feces to reduce odor. Dr. Elsey’s Senior Litter is cleaner and hypo-allergenic as it contains no organic material such as wheat, pine, corn and paper litters. Each box contains a free Litter Box Solutions Booklet.